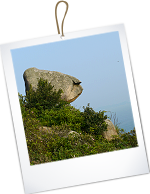 Ling Kok Shan is a hill located in east of Lamma Island. 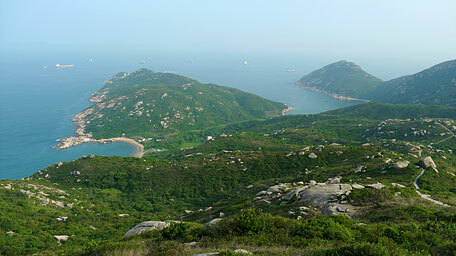 Along the way, it offers a full view over south of HK Island as well as many peculiar rocks could also be seen. Tsz Lo Lan Shan Tr. 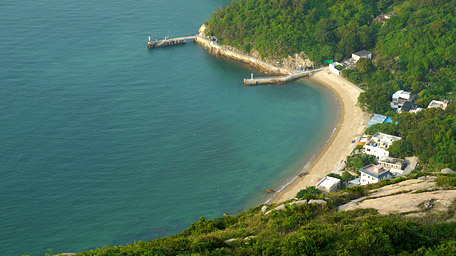 At Mo Tat Wan, you could take a ferry to Aberdeen. Due to Google changing the terms of Google Map, the daily usage rate will be limited. Please refer to the static map instead if the above map could not be displayed or used normally. I apologize for the inconvenience. 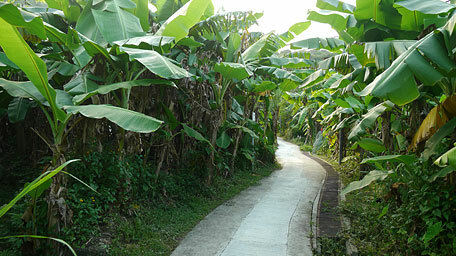 Follow Sok Kwu Wan First Street to the right from the pier. 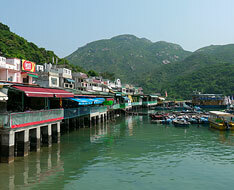 Pass the seafood restaurants and shops, it comes to Tin Hau Temple. 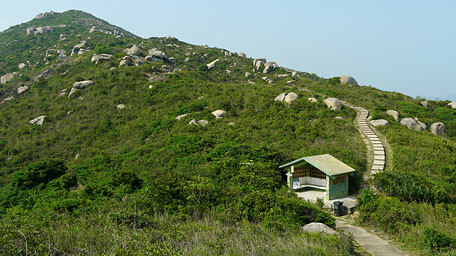 According to the signpost (the way to Tung O Wan and Shek Pai Wan), the trail starts the uphill path on the left. Along the concrete path, it cuts through the woods in the beginning. After the gentle ascent, it leads to the crossing in the hill recession. 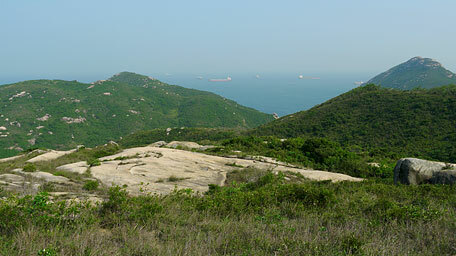 From the crossing, taking the left way climbs Ling Kok Shan, going forward will descends to Tung O Wan. 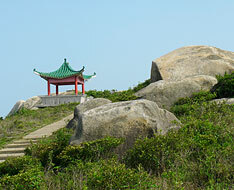 There is a pavilion on the right up where could see the striking rocks distributed on the hillside, and a wide rocky slope as a natural lookout platform behide the pavilion that offers the majestic view toward the south landscape. From the crossing, ascend the steps on the left. 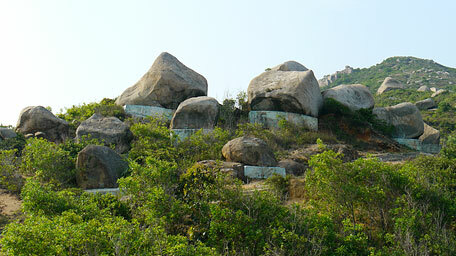 Along the trail, you could see a group of rocks with a concrete base respectively on the left. There is a narrow tunnel as air-raid shelter under them. Up ahead, Tung O Wan, Shek Pai Wan and Yung Shue Wan could be been and it arrives at the hilltop. Afterward, follow the trail ahead along the ridge, it opens up fully. 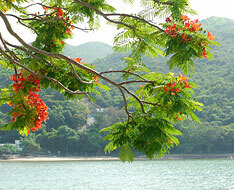 Overlook northward, it offers a scenic view on Picnic Bay and the north of Lamma Island. 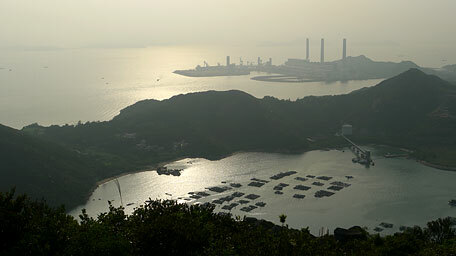 Looking far further, a full view could be seen over the south of Hong Kong Island which undulated rolling hills from the west Cyberport horizontally extend to the east Stanley and Tai Tam. 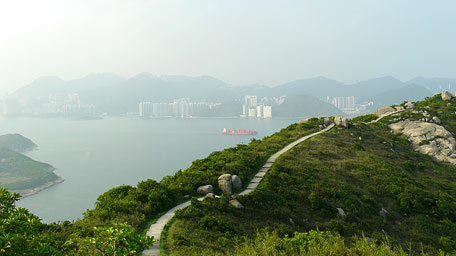 Passing through the transmission station, the trail descends the flight of steps with the view over Tung O Wan and the capes nearby that stretches to the sea. 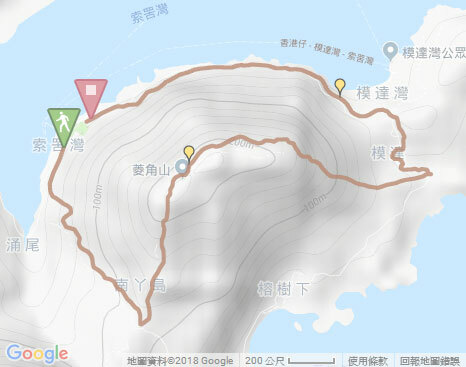 After the downhill, it leads to the junction and then follows the left path to Picnic Bay. It cuts through the woods and passes the old village houses. Heading to the right junction to Mo Tat Wan, still go ahead. 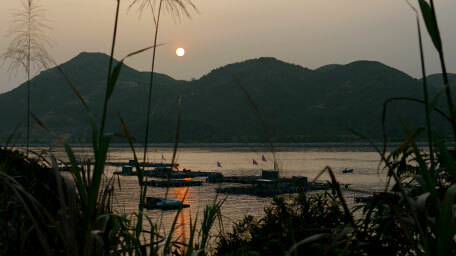 Along the coast, the fisheries could be seen off the shore. Finally, it arrives at the pier in Picnic Bay. Exit: At the pier of Mo Tat Wan, you could take a ferry to Aberdeen.